Manila, Philippines - Sen. Miriam Defensor Santiago said that as a detention prisoner, Janet Napoles should observe a "pay-for-stay" program, so that the Philippine National Police (PNP) can stop using public funds for her monthly expenses amounting to P150,000. 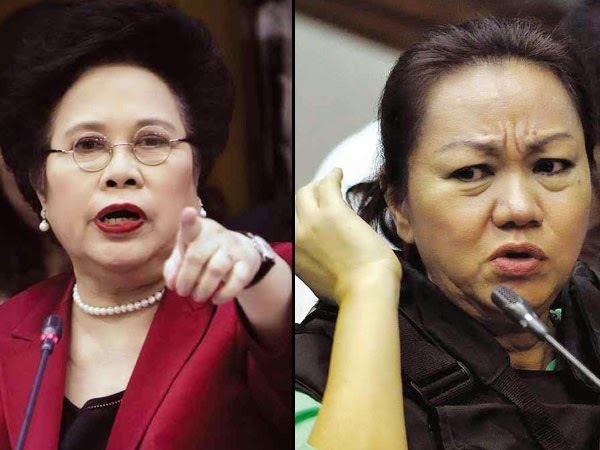 Santiago said that President Aquino should save public funds by compelling a detention prisoner like Napoles to make a choice between ordinary stay in jail at government expense, or stay in an enhanced facility at the prisoner's own expense. In the United States, this is called the "pay-for-stay" program. Santiago said that American courts have upheld "pay-for-stay" programs in such states as Texas, California, New York, Illinois, Tennessee, Ohio, and Pennsylvania. She said the most famous of the "pay-for-stay" American decision is the 2000 case of Tillman v. Correctional Facility, decided by the U.S. Court of Appeals. "Pay-for-Stay" does not constitute cruel and unusual punishment, so long as the inability to pay the fees did not affect the subject prisoner's access to needed services. The program does not impose Excessive Fines, since the fees charged to the prisoner were not fines, but they were rehabilitative rather than punitive in nature. There was no denial of Due Process, because the American system provided a prisoner grievance procedure. There was no violation of Equal Protection under the so-called "rational basis review," where it is shown that there is a rational relationship between the end sought to be gained, and the means employed. After analyzing the Tillman decision, Santiago said that even if the prisoner's constitutional rights may have been violated by the "pay-for-stay" program, still the court implied that the violation was outweighed by the state's interest in "sparing the taxpayers the cost of imprisonment."